If like me, you grew up in the 80’s, this blog entry title’s play on a classic tune from that era felt appropriate. If not, go ahead and make “that face” and continue reading 😉 We were only able to get to this point because of the generosity of our close family friend Joe Schroeder, Penns Mault owner Adam Seitz, our leasing farmer Ted Weisner, family friend Nick Dragone and fellow hop Farmer Tess Weigand. Our buddy Adam Seitz, owner of Penns Mault, sending us off with his barley seed and a pat of good luck! “Big Red” and I headed off for our Farm in Saint Marys. When Joe heard back in late July that we had the opportunity to plant malting barley at our Farm…but still didn’t have the equipment necessary to do so…he offered to do the plowing and discing work for us for free…yes FREE! We only needed to pay him for the fuel for his Mahindra – a newer tractor for him that he was itching to really get into some real Farm work. We found some for him. 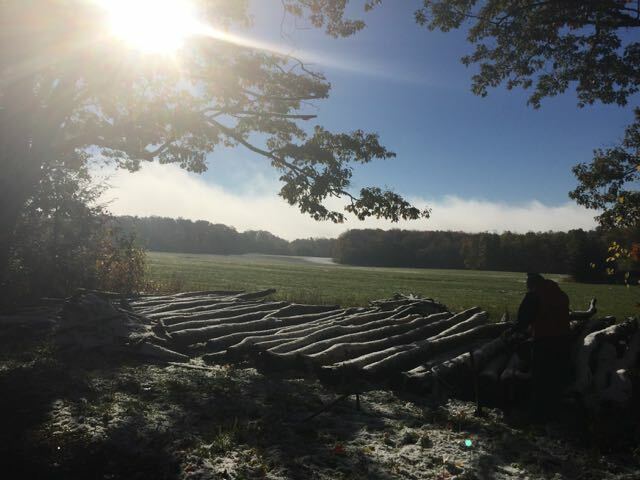 Adam was searching for a few additional locations to plant the barley seed he would be receiving in late Summer…we simply needed to find a way to get it in the soil, but Adam did not charge us for the seed. And Ted had the seed drill we needed to take that final step to get it planted correctly. Straub Brewery Brewmaster Vince Assetta joins us at the Farm to see the next exciting step in our partnership. 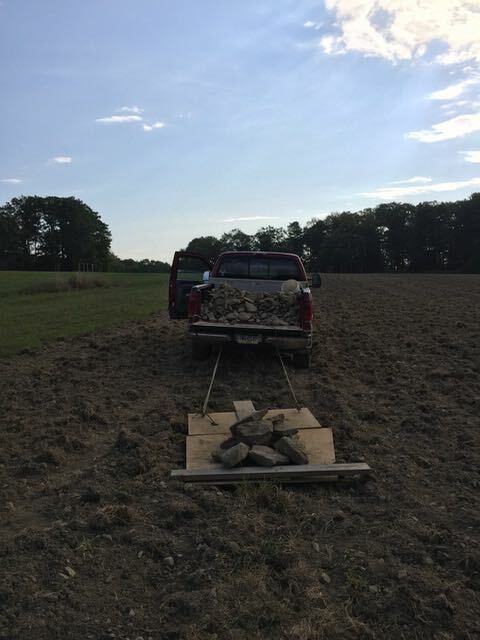 Between the plowing/discing and before the planting, myself and a family friend, Nick Dragone, spent two days pulling the larger rocks out of the field. This is pretty much standard operating procedure in the Mid-Atlantic and New England states. If you’ve ever wondered where all those beautiful, natural rock fences came from encircling farms in this part of the country…wonder no more. While I would’ve LOVED to have gotten more rocks out of the field, it just isn’t practical to do so with only two people doing it by hand. There are rock pickers, a.k.a. skeleton buckets, out there to do this but that type of machinery is a few years down the road for us. We pulled some doozies out of the field and that part of the process, along with Nick’s help, couldn’t have been accomplished with out the use of “Big Red”…Tess Weigand’s (owner of Happy Valley Hop Yard) Ford F250 diesel truck. It was a beast and helped us pull tons of rock out of the field. BIG rocks go on our make-shift sled, regular sized rocks get added to the truck bed. 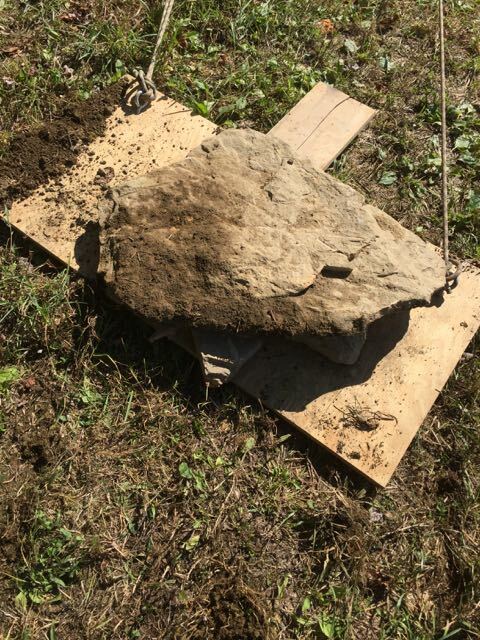 I’d like to say this was the biggest rock we pulled out, but not so…there were bigger ones! A few days later after Nick and I wrapped up, Ted did his thing and when all was said and done, we had about 6 acres of barley in the ground by the later part of the month. We planted a Winter variety of barley for a couple reasons. First, because our transitions from Winter to Spring tend to take longer that other parts of the country growing barley…and our Springs are wetter…we wanted to give the barley a good head start now. Getting the barley in and established before Winter sets in, will allow it to go dormant once the snow falls. The barley will be insulated under the snow…assuming we don’t get ice first!…and come Spring, it’ll have that much of a head start versus us having to wait for the fields to dry out. And second on a related note, as it will have that head start it’ll also have that over the weeds to outcompete them. The barley is already a few inches and growing. Now we just need a nice blanket of insulating snow and then we wait. The barley was planted to the South of the new hopyard, so it was planted in that same batch of clover as the hopyard. That again is a good thing as far as nutrient and lower weed competition are concerned, however that clover is conventional so we won’t be able to include this barley in our certified fields. We will manage them according to Certified Naturally Grown and organic standards going forward, so in three years after a transitional period, they will be included on our declaration. Hops poles are debarked, capped and ready to go. Overlooking the new hopyard area, the barely planting below that and in the distance far way, our existing hopyard. ← Harvest Time Has Arrived!